Soft tissue deflation and descent have long been implicated in the pathogenesis of facial aging. In the periorbital area, the upper orbital region is thought to change by descent of the eyebrow, as well as deflation of brow fat. While the understanding of the aging changes in the upper eyelid region are relatively simple, the lower eyelid poses a myriad of aging changes, each demanding a specific management plan. These can be best described in terms of elevations, or 'Hills' and hollows, or 'Valleys'. This article simplifies the understanding of the lower eyelid in the light of anatomical knowledge, and available literature. It forms a basis of easy diagnosis and treatment of the soft tissue changes in the lower eyelid and malar region. Dermatologists and oculoplastic surgeons are often consulted for lower eyelid concerns such as eyelid bags, dark circles under the eye, wrinkles around the eye, and under-eye hollows. Sometimes, the patient simply reports a 'tired look', not exactly knowing what is the exact problem. Unfortunately, the lower eyelid has been the victim of a 'one size fits all' approach of fat and/or skin excision for many of these cases. Understandably, this approach will not work except in a minority of cases. The lower eyelid anatomy, and the aging changes are complex, and it is important to understand each of them. Based on my extensive experience in the management of periorbital aesthetic concerns, I present a simplified understanding of the several valleys and hills in the lower eyelid region. This differentiation enables a customised management approach to the lower eyelid. The hollows in the lower eyelid region include the tear trough (orbital rim hollow), eyelid crease hollow and the zygomatic hollow [Table 1]. The tear trough depression is an important feature of eyelid and midface aging. The terms 'nasojugal depression' and 'tear trough deformity' are used synonymously. The tear trough seems to be easily seen and treated than be anatomically defined. There is a lack of agreement among various specialists about the exact location. The tear trough is best defined as the depression of the medial lower eyelid just lateral to the anterior lacrimal crest and limited in its inferior aspect by the inferior orbital rim. This region corresponds anatomically with the location of the lacrimal sac, hence the term “tear trough” [Figure 1]. It appears as a result of several factors, including loss of subcutaneous fat, thinning of the skin over the orbital rim ligaments, and descent of the cheek. Partly, the formation of the tear trough is also contributed by partial resorption of the underlying bony structure, the orbital rim., Laterally, the tear trough depression may blend into the triangular malar mound. While the term 'tear trough' would be more appropriate for the younger age group (where it is not an aging change), in the older age group it is aptly termed as orbital rim hollow by Goldberg, who has beautifully described the three hollows that dominate the lower eyelid and malar region. The orbital rim hollow corresponds with the location of the orbital rim or orbitomalar ligament. Medially, it is synonymous with the 'tear trough'. Laterally, it follows the circular contour of the inferior orbital rim. It is bound by the prominence of the orbital fat above, and by the sub-orbicularis oculi fat (SOOF) and the cheek fat pad below. Somewhat in the mid-pupillary line, overlying the infra-orbital foramen, the orbital rim hollow widens into a triangular pit. The orbital rim hollow can also be noted in the superior orbit as a depression in the sub-brow region [Figure 2]. The Zygomatic hollow corresponds to the location of the orbitozygomatic ligament [Figure 2]. It lies along the origin of the levator labii superioris and zygomatic muscles. The zygomatic hollow is bound by the triangular malar fullness above and by the lateral cheek fat below. The eyelid crease hollow is formed by the cutaneous attachment of the lower eyelid retractors, and represents the surface marking of the lower border of the tarsus [Figure 2]. Also labelled as the septal confluence hollow by Goldberg, this eyelid crease hollow is much less pronounced as compared to the upper eyelid crease. However, the lower eyelid retractor, which causes this hollow, is a mirror image counterpart of the levator muscle in the upper eyelid. It is not linked to any bony attachment. It is bounded superiorly by the orbicularis roll, and inferiorly by the orbital fat prolapse. Among all the valleys, the tear trough (orbital rim hollow) receives the maximum attention with respect to treatment modalities. Hyaluronic acid fillers and autologous fat transfer are the two commonly employed techniques to fill this valley. In majority of cases, filling is required in the medial half (medial to the mid-pupillary line). The zygomatic hollow receives attention with respect to the filling of the malar volume loss. Filling the zygomatic hollow along with the tear trough restores the malar volume and thereby the malar prominence. The eyelid crease hollow is an important landmark of diagnostic significance. It helps differentiate the two hills: Orbicularis roll (which lies above it), and fat bag (which lies below it). From treatment perspective it is probably of less significance, and in fact should not be addressed with fillers. 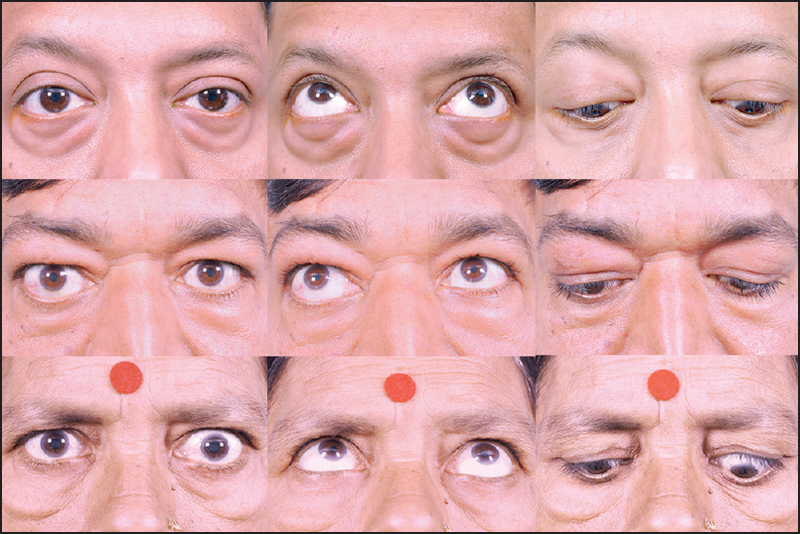 The elevations or 'hills' that occur in the lower eyelid and malar region include the orbicularis roll, orbital fat bag, the fluid bag and triangular malar mound [Table 1]. The lower eyelid orbicularis prominence can be a cosmetic concern, and is often wrongly referred to by physicians as 'orbicularis hypertrophy'. The term 'hypertrophy' is probably a misnomer, since no authors have demonstrated histologic evidence of orbicularis hypertrophy in the lower eyelid fold. More likely, orbicularis roll describes a prominent pretarsal orbicularis roll [Figure 1], that accentuates when the orbicularis contracts during eyelid closure, or facial expressions such as smiling. In a young person, this prominence of orbicularis can be a stand alone feature, and may lead to a reduced vertical height of the palpebral aperture of the eye during smiling or laughing. 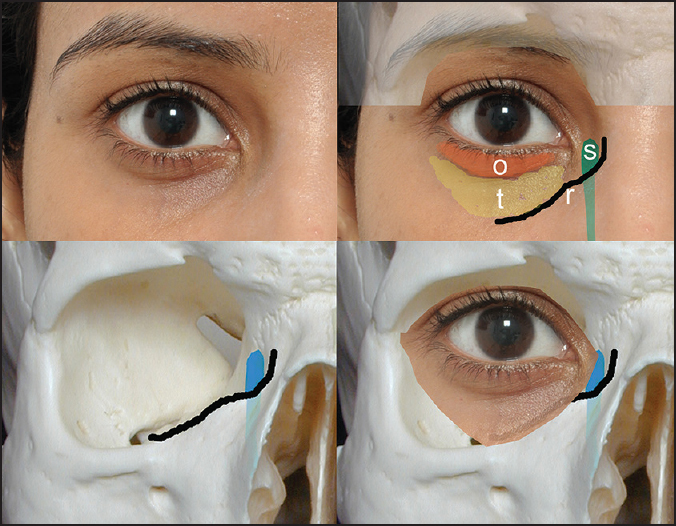 Injection of 1-2 units of Botulinum toxin type A into the pre-tarsal orbicularis in the mid-pupillary plane can eliminate this aesthetic concern [Figure 3], top left and right]. With ageing, the connective tissue attachments between the skin and the underlying muscle attenuate, and contribute to dynamic and static lines [Figure 3], bottom left and right]. The inelastic skin of the lower lid is pushed up towards the eyelid margin creating horizontal or oblique lines that are accentuated with smiling. The orbicularis roll in an aging person would require conservative reduction in the muscle during a blepharoplasty. This could be considered as the commonest lower lid 'hill' that presents to the aesthetician. Orbital fat prolapse is bound superiorly by the eyelid crease hollow, and inferiorly by the orbital rim hollow. The fat mound is often compartmentalised by the inferior oblique and the arcuate expansion into a central, medial and lateral fat pad [Figure 4]. The fat actually lies in a deeper plane, behind the orbital septum. The orbital fat seems more prominent with advancing age, and also with up-gaze. It appears to reduce on down-gaze. 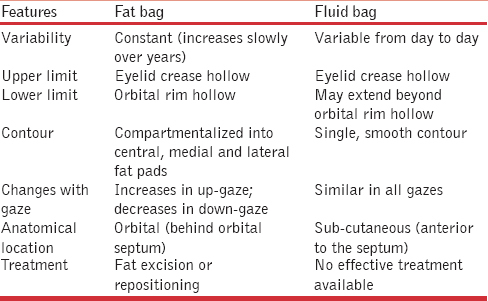 Eyelid fluid bag can mimic fat prolapse, and it requires experience to differentiate the two [Table 2]. It would be bound superiorly by the eyelid crease hollow. Inferiorly, it need not be bound by the orbital rim, and may extend beyond it. It also does not show the typical compartmentalisation like fat bags, and appears more or less the same in up-gaze and down-gaze. Fluid bags can have a bluish hue, and may be worse in morning hours, during the menstrual period, facial allergy, or even after a salty meal. Rarely, orbital fat and fluid may coexist [Figure 4], bottom images]. The triangular malar mound or festoon is a contour that occurs within a fluid sponge, bound above by the orbital rim hollow and below by the zygomatic hollow. The orbitomalar ligament above, and the orbitozygomatic ligament below limit this spongy fluid contour [Figure 2]. Prominent triangular malar mounds often run in families and can be variable. It is often more prominent in patients with thyroid disorder, probably due to the increased fluid retention in this region. It may also have an allergic component. With loss of skin elasticity, the malar mound can become an actual festoon [Figure 5]. The orbicularis roll can be treated with Botulinum toxin in the young, and can be addressed surgically during blepharoplasty in the old. Orbital fat prolapse requires conservative fat removal or repositioning, and is the surgically most amenable 'hill' in the lower eyelid. Fluid bag and triangular malar mounds are primarily areas of fluid retention, and difficult to treat. A blepharoplasty is ineffective in a fluid bag, and infact can worsen it due to disruption of lymphatics. When using hyaluronic acid fillers for the orbital rim hollow, patients with triangular malar mounds should be preferably avoided, since the gel can imbibe more fluid, and look unnatural. The volumetric changes in the lower eyelid require a customised approach. I personally prefer to first establish an anatomic definition for the patient's 'tired look'. Is it the fat bag? Or is it the orbital rim hollow? Going through the previous photographs of the patient often helps determine which finding has appeared recently. It is always helpful to 'rewind' the years by addressing that recent change, rather than give a new look to your patient. In summary, the valleys that are amenable to correction include the tear trough, and the zygomatic hollow. The hills that are amenable to correction are the orbicularis roll and fat prolapse. A combination of fat prolapsed and a tear trough (hill and valley) may require a blepharoplasty, followed by fillers. Bosniak S, Cantisano-Zilkha M, Purewal BK, Torres JJ, Rubin M, Remington K. Defining the tear trough. Ophthal Plast Reconstr Surg 2007;23:254-5. Lambros VS. The Dynamics of Facial Aging. Presented at the Annual Meeting of the American Society for Aesthetic Plastic Surgery. Las Vegas, Nevada: American Society for Aesthetic Plastic Surgery; 2002. Pessa JE, Zadoo VP, Mutimer KL, Haffner C, Yuan C, DeWitt AI, et al. Relative maxillary retrusion as a natural consequence of aging: Combining skeletal and soft-tissue changes into an integrated model of midfacial aging. Plast Reconstr Surg 1998;102:205-12. Pessa JE. An algorithm of facial aging: Verification of Lambros's theory by three-dimensional stereolithography, with reference to the pathogenesis of midfacial aging, scleral show, and the lateral suborbital trough deformity. Plast Reconstr Surg 2000;106:479-90. Goldberg RA. The three periorbital hollows: A paradigm for periorbital rejuvenation. Plast Reconstr Surg 2005;116:1796-804. Naik M. Blepharoplasty and periorbital surgical rejuvenation. Indian J Dermatol Venereol Leprol 2013;79:41-51. Bernardi C, Dura S, Amata PL. Treatment of orbicularis oculi muscle hypertrophy in lower lid blepharoplasty. Aesthetic Plast Surg 1998;22:349-51. Goldberg RA, McCann JD, Fiaschetti D, Ben Simon GJ. What causes eyelid bags? Analysis of 114 consecutive patients. Plast Reconstr Surg 2005;115:1395-404.